Domaine Mosse is a leading organic producer of delicious wines particularly those made from Chenin Blanc. Living Wines has been importing their wines for many years and they have always been very popular in Australia during that time. 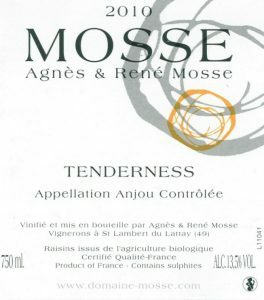 People praised the wines, clearly had immense affection for Agnès and René Mosse, and also talked about the influence they’d had on other wine makers who’d worked with them to gain experience and then started making their own wines. Since then we have got to know Agnès and René and to know more about their wines. We have found that they not only turn out excellent red wines but their white wines made from Chenin Blanc are seriously good wines as well. Their vineyards at Saint Lambert du Lattay are immaculately maintained and we have a particular affection for the Bonne Blanches vineyard which is where their oldest Chenin Blanc vines are to be found. The Mosses are certified Biologique by Qualite France . 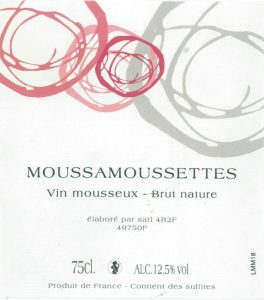 The Domaine Mosse pet nat Moussamoussettes is definitely a cult wine! Every year it keeps getting better and we are more than excited about this year’s offering for two reasons. The first is that many of our friends who have tried it in France this year say it is the best ever! The second is that this year for the first time the main grape variety (60%) is one of our favourite red grapes – namely Pineau d’Aunis – the same grape that goes into some of the fabulous pet nats from Jean-Pierre Robinot. We love this wine. It is pink, delicious, limpid, very slightly sweet and the perfect aperitif for a spring or summer lunch or evening aperitif. This year the Pineau d’Aunis is supplemented by the local Grolleau Noir variety. The juice was fermented in barrels and bottled when it had reached 18 grams of residual sugar. It then kept fermenting in the bottle until most of the sugar was gone. The result is a perfect example of a pet nat that we look forward to drinking through the spring. Once again, the Mosse family has had to buy grapes from the south of France to ameliorate the effects of the bad weather conditions they experienced in 2016. This time they have bought grapes from a friend of Eric Pfiferling in southern France in the Rhone Valley on the eastern side of the river not too far from Avignon (which comprises the Tavel appellation). Where the grapes came from and the fact that the grapes had to travel back to the Loire Valley to be processed gave rise to the name. It’s 40% Tavel Grenache, 40% Tavel Cinsault and 20% Loire Valley Gamay, made in the rosé style. We rarely get to buy Magic of Juju, a white wine the Mosses make each year for early drinking. We take Moussamoussettes as soon as it is bottled, early in the new vintage, and it’s too early for Magic of Juju. By the time we get to order again it’s gone. But this year we were visiting in July, just after it was bottled and, most important, the labels had arrived. We felt it was a lucky break – we were meant to have it – so even though we had just received a shipment of other wines we ordered again immediately. This year’s vintage is predominantly Chenin Blanc with some Grolleau Gris. There is also a small number of magnums. One sip of this wine and you can almost taste the quartz and schist in the vineyards that this cuvée was made from. 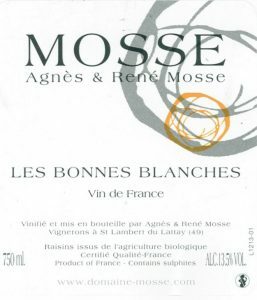 During this vintage the Mosse vineyards suffered significant damage from hail, so this cuvée is a blend of grapes picked from three of their best vineyards – Les Bonnes Blanches, Marie Besnard et Le Rouchefer which is where the three parts of the name come from. The fermentation was carried out with wild yeasts as always and the malolactic fermentation was also natural. The wine was matured in barrels that had been used for two years previously and reamined there for 12 months before bottling. It is a characteristic Mosse Chenin with that tell-tale signature aroma and taste made even better for the grapes coming from such excellent vines. This is a relatively new cuvée (this is the third vintage) comprised of the Anjou favourite grape variety, Grolleau Noir blended with Gamay, Grolleau Gris and Côt. The grape bunches were macerated together in a manner approaching carbonic maceration. 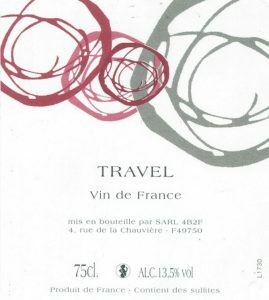 We tried this lovely wine within an hour of it arriving at our warehouse and we were very pleasantly surprised at how well it had survived the journey from France. It is a soft, energetic, elegant, well-structured and eminently drinkable red wine that exhibits considerable charm and character. This is a perfect wine for drinking right now in a park or at a barbeque. This Mosse wine is very silky and called Cabernet-Franc. It is from the 2016 vintage. It’s 80% traditional macerated destemmed grapes and 20% carbonic maceration for almost a week. They were pressed separately but aged together. It was in bottle for one year before release, which has ensured the tannins are beautifully integrated. A Vin de France, this is made with grapes some of the vines that would have traditionally been in the Anjou Rouge. They have eschewed the appellation system now for almost all of their wines. René Mosse didn’t bother to submit his Bonnes Blanches to the authorities again this year. He knows his wine is good and he knows it will sell so he doesn’t need the appellation. He therefore has released it as a Vin de France as so many winemakers are doing these days. Like the Le Rouchefer it is a white wine made from 100% Chenin Blanc. The vines are from a 2.5 hectare plot where the vines are over 35 years old and the yield is very low at only 20 hectolitres per hectare. The wine is aged in wooden fûts. Grapes are picked by hand on this domaine. This is a very good food wine. The alcohol percentage is 13.5 and there is a very small amount of residual sugar while still finishing dry. This is a stunning example of Chenin Blanc. It displays precision and strength and the spicy notes linger for ages. 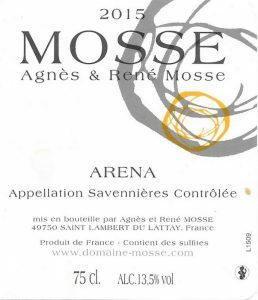 This famous white wine from Agnès and René Mosse is made from a small plot (.67 hectares) of the oldest vines from the amazing Bonnes Blanches vineyard which is comprised of sand and clay over schist. Like the Le Rouchefer it is a white wine made from 100% Chenin Blanc. The vines are from a little .66 hectare section of the vineyard where the best vines grow and where the vines are over 35 years old and the yield is very low at only 20 hectolitres per hectare. The wine is aged in wooden fûts for at least 12 months. Grapes are picked by hand on this domaine. This is a very good food wine with a mineral edge, lots of complexity and a very long finish. If you want to experience an elegant Chenin Blanc, then this is the wine to try. When we opened the first bottle of this cuvee to arrive in Australia we were immediately transported back to the days of the Anjou Blanc and the highly popular Magic of Ju-Ju which so typified the wines of the Mosse family. These wines are always matured in large wooden barrels that have previously had a few years of use. The result is always a crisp, clean, slightly oxidative wine that lingers on the palate for ages. This one is particularly good and we think that it will disappear very quickly. The Anjou Rouge is a blend of Cabernet Sauvignon and Cabernet Franc picked from small parcels of old vines (ranging from 30 to 50 years old). This is a pure, thrilling wine that is fresh and lively on the palate and has a lingering finish. There are aromas of blackcurrant leaf, tobacco and cocoa notes that linger and a quite complex aroma. The tannins are quite fine and well-integrated. This is an elegant, moorish wine. The Anjou Blanc is made from Chenin Blanc grapes picked from younger vines in four different parcels of the Mosse vineyards. The vineyards lie on south-west facing slopes and the soils are composed of sand and gravel lying on a bed of schist. The grapes are picked and sorted manually. The average yield is very low for a dry white wine at 25 hectolitres per hectare. The grapes are left to ferment naturally in wooden fûts and undergo both alcoholic fermentation and malolactic fermentation. There is a tiny amount of residual sugar in this fresh-tasting wine with a lovely mouthfeel. This is a great wine redolent of spice and minerality which linger on the palate for ages! The Le Rouchefer is a pure Chenin Blanc that comes from a small parcel of gently sloping, southwest facing land that extends over 1.66 hectares with clay and gravel (studded with quartz) sitting on schist. The yield from this vineyard is very low with 20 hectolitres per hectare being common. The grapes are hand harvested and meticulously sorted before slow pressing and then being allowed to go through both alcoholic and malolactic fermentation. The wine is aged in old barrels for 12 months. There is a tiny bit of residual sugar in this wine which adds to its charm. This is a complex and elegant wine that matches beautifully to a range of foods including grilled fish, sweetbreads, chicken and mountain cheeses. The Savennieres appellation occupies a small area (only 150 hectares) just south of the city of Angers. Some of the great wines of France are produced here from the sandy soils (Aeolian sand) that sit over a shale base. This is a dry wine style made from Chenin Blanc from a tiny plot of land that is less than half a hectare – therefore there is very little of this wine available. The grapes were pressed gently and then allowed to undergo natural fermentation in wooden barrels that has already been used for two vintages and hence imparted no wood flavours to the wine. 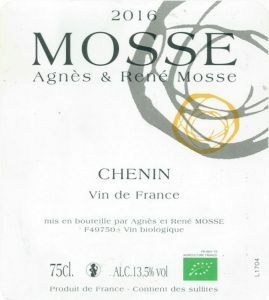 There is a total of 2 grams of residual sugar which is tiny but so common for these delightful Chenin Blanc wines from the Mosse domaine. This is one of the famous sweet wines produced in this area just below the city of Angers and which is close to the Layon River. Here the Chenins are allowed to ripen through to the end of October or early to late November to develop those characteristics that make these sweet wines so desirable. This vintage was particularly favourable for the production of sweet wines. This cuvée has 11 grams of residual sugar but this is balanced by beautiful acidity which makes it perfect as a dessert wine or, as the French love to do, as an aperitif. The grapes for this wine were picked on the 27th October and the juice was transferred to old barrels for the fermentation and aging. The yield for this vintage was an incredibly low 9 hectolitres per hectare! The level of alcohol is a low 12%. A gorgeous wine that comes in 500 ml bottles. The Tenderness is a wine made in a style called Sec Tendre. It is made from 100% Chenin Blanc in a similar way to all the other Chenin Blancs made at this domaine. The small amount of residual sugar makes it a perfect wine to serve as an aperitif on the deck in the late afternoon, but it also goes very nicely with a range of foods. We like this style of wine with charcuterie, but the sweetness allows it to match with desserts and hard cheeses as well.